This site-specific installation is new territory for Hasegawa, who translates his practice of primarily composing his works with large paint strokes to the sculptural medium of wood, creating a hybrid form that sits between painting and sculpture. He creates portraits of bears, who in addition to their reputation of being fiercely protective of their young, are highly respected in many cultures and are considered to be ancestral spirits. They have played a prominent role in the arts and mythologies of numerous cultures, ranging from Russia, China, Finland, Scotland, Korea, the Ainu of Japan, and the U.S. His many bear portraits throughout the city are intended to be protective figures in the neighborhoods they inhabit. 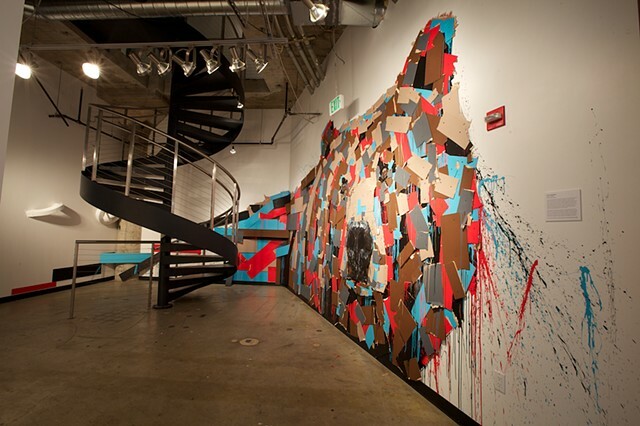 Special thanks to Recology and their Artist in Residence Program for providing reclaimed paint and wood for this piece.